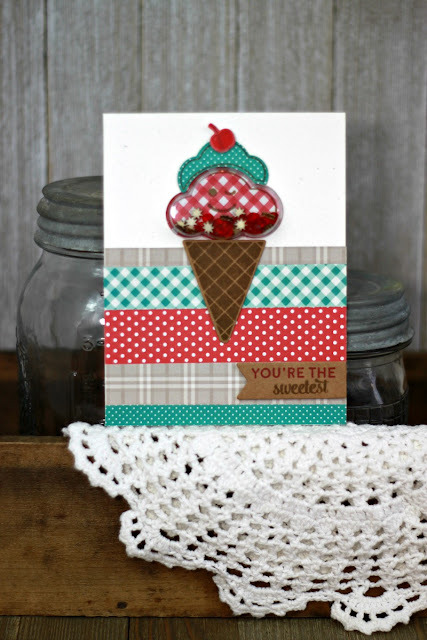 Have you seen this new ice cream stamp and die set from Hampton Art/Jillibean Soup, it really is so sweet! This card begins with the Jillibean cloud shaker card base and insert. The border strips were added from the new paper pads, All About Dots and All About Plaid. The first stamping is done onto kraft paper to create the cone in brown ink and the sentiment in red and brown ink as shown. Next the top dip of ice cream was stamped in brown ink onto the teal dots paper. Then the bottom scoop of ice cream was stamped onto the red plaid paper in brown ink, including that adorable winky eye face. The last stamped item is the cherry which was stamped in red ink onto the red plaid paper. Using a die cutting machine and the coordinating dies cut out the cone, two dips of ice cream and the cherry. Add the sentiment to the bottom right of card as pictured. Then add the ice cream cone with 3D foam dots. Adhere with regular adhesive the bottom dip of ice cream being sure to line it up inside the cutout portion of the shaker card. Add the top dip of ice cream as shown and then top it all off with the cherry on top. Then take a moment to pick out your shaker fillers, this card uses red jewels and wood veneer starbursts. Looks good enough to eat, but better to just mail it to a sweet friend.